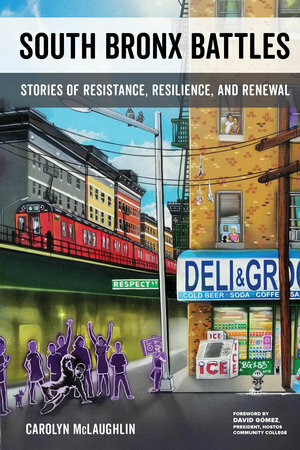 Community activist Carolyn McLaughlin takes us on a journey of the South Bronx through the eyes of its community members. Facing burned-out neighborhoods of the 1970s, the community fought back. McLaughlin illustrates the spirit of the community in creating a vibrant, diverse culture and its decades-long commitment to develop nonprofit housing and social-services, and to advocate for better education, health care, and a healthier environment. For the South Bronx to remain a safe haven for poor families, maintaining affordable housing is the central—but most challenging—task. South Bronx Battles is the comeback story of a community that was once in crisis but now serves as a beacon for other cities to rebuild, while keeping their neighborhoods affordable. Carolyn McLaughlin is a social worker who worked in the South Bronx for fifty years. For thirty-four years she led BronxWorks, which became a highly respected human service agency that helps 35,000 people a year. David Gómez is President of Hostos Community College in the South Bronx.